I just love that Star Wars font they used on their 3.x manuals. WordStar was a popular word processor during the early 1980s. However, it was also a shining example of a software product that could not keep up with the rapidly changing landscape of the 1980s. The first incarnation of MicroPro's CP/M word processor, written by John Robbins Barnaby (a "mad genius of assembly-language coding,") for MicroPro founder Seymour Rubenstein, was released in 1976 and went by the name "WordMaster". WordStar version 1.0 for CP/M was released in September 1978. There were several 0.x releases prior to 1.0 sold as release products. Version 1.x was much different from later versions. MicroPro Wordstar became an enormously popular word processor on 8-bit CP/M machines. It was tightly coded in 8080 assembler, packing in all kinds of features. 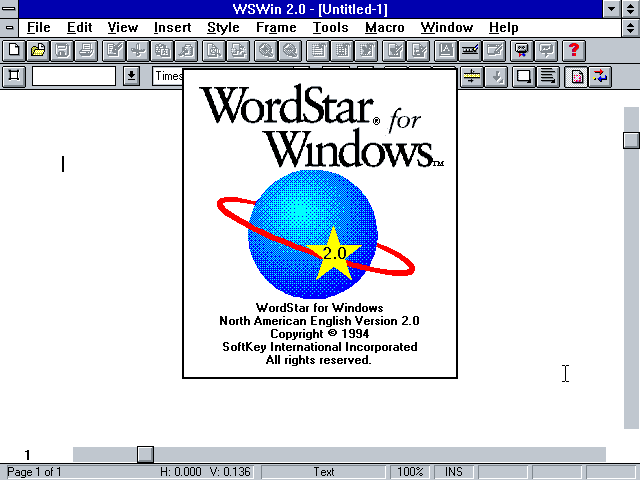 WordStar was system independent. It made no assumptions about the system it was running on, and used only standard CP/M I/O. It was configurable for a variety of terminal types. This meant that despite wild differences between different CP/M systems, the same binary could be imported and run on almost any 8080 or Z-80 based system regardless if it had an integrated video system or external terminal. - In contrast, many word processing systems of the late 70s were built using dedicated single-purpose proprietary hardware. If you wanted to use another vendor's hardware, you had to use their software too. WordStar was the first microcomputer word processor to offer mail merge and "WYSIWYG", in that it accurately showed line breaks and page breaks. Important new and popular features included the ability to mark blocks to copy or move, column editing, editing large text files, integrated printing and formatting, and a "non-document" mode for editing pain text files. 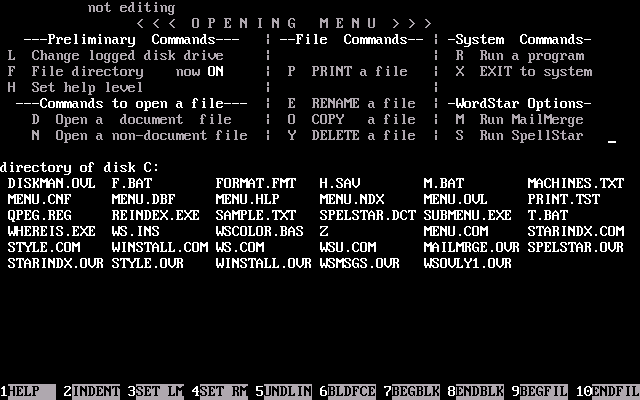 WordStar was ported to a number of other systems including Unix, PC/MS-DOS, the TRS-80, Apple II CP/M, and CP/M-86. It was bundled with systems such as Osborn and Kaypro computers. WordStar competed directly against many word processors, including Electric Pencil, Microsoft Word for DOS, Multimate, Volkswriter, XyWrite, and WordPerfect. The first IBM PC version was WordStar 3.0, released in April 1982. The initial version of WordStar for the PC was a direct assembly translation from CP/M-80 to PC-DOS/x86. Because it was a "well behaved" DOS program, using only DOS I/O, just as the CP/M version did, it worked well on many less hardware compatible MS-DOS clones. Initially, its compact assembly-level programming gave it a speed advantage, but it had some downsides. On the IBM PC, 3.x lacked any IBM PC specific optimizations. Due do its 8-bit 8080/Z80 source, it was limited to about 64k of RAM. While other applications began writing directly to video memory, gaining a huge speed boost, WordStar continued to use slow DOS I/O. It did not make use of extra IBM keyboard keys. And like the CP/M version, it did not support subdirectories. A couple of minor updates brought it to WordStar version 3.3, that although quite popular, then dragged on for a long while with no major updates. This is when things really started to fall apart. Supposedly, somewhere along the line they lost the original documented 8080 assembler source code used for both the CP/M and DOS versions. But the original author, John Robbins Barnaby, had left. MicroPro briefly marketed an integrated office suite system called Starburst, but this was quickly killed off. 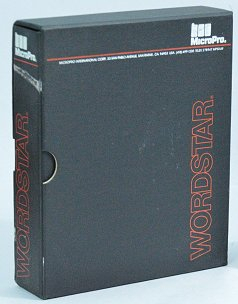 In 1985 MicroPro released WordStar 2000. WordStar 2000 was a complete re-write in C. The product used different file formats, and operated differently, requiring much re-learning. To make matters worse, the original WordStar 2000 r1.00 release was copy protected, making it harder to install and incompatible with some PC clones. To confuse the market further, MicroPro also released a dumbed down word processor called "MicroPro Easy" (reportedly written in Modula!) targeted at budget users. MicroPro Easy also went under the names "MicroPro Easy Extra" "WordStar Express", "WordStar Colt", and "WordStar 1512". It worked kind of like WordStar 3.3, and was not related to WordStar 2000. What a mess. Anyway, WordStar 2000 was considered such a failure that MicroPro acquired NewStar, a WordStar clone, and instead used that as the basis for WordStar 4, released in 1987, and later DOS releases. But by that time it was really too late, as they lost out to WordPerfect. WordStar 7d, released in 1992, was the last DOS version of WordStar. Like all once popular products, an unrelated zombie product must arise from the dead bearing the same name. In a last ditch attempt to stay in business, MicroPro, now named "WordStar International", licensed a Microsoft Windows word processor called Legacy from a company named NBI, and slapped the WordStar name on it. This was released in 1991. WordStar for Windows was more of a frame-based desktop publishing tool. It did, however, offer keyboard command compatibility with earlier WordStar. In 1994, WordStar International merged with SoftKey Software Products. 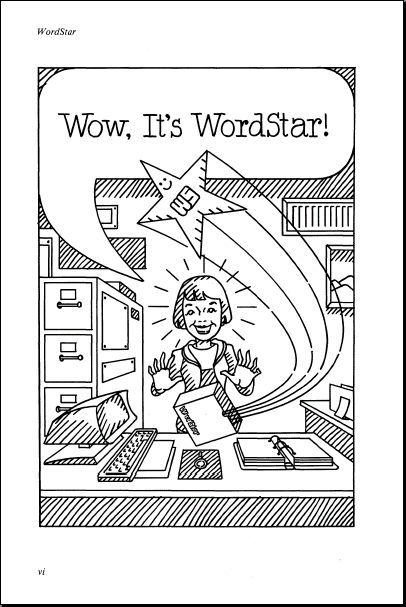 If I recall correctly, WordStar was the first word processor I used on IBM PCs. I don't recall liking it all that much, but the keyboard commands made more sense and were easier to remember than most others. I think it could also edit very large files. Other word processors would try to load an entire file in to RAM, and if it didn't fit they would just barf. Interestingly, many editors that followed offered WordStar compatible keyboard commands. Wanted: More early versions. According to various searches WordStar 0.89, WordStar 0.91, and WordStar 0.92 existed and were sold to the public. WordStar 1.0. Early WordStar 2.0 releases were reported to be copy protected. It would also be great to get full disk dumps for specific platforms. Off hand I know there were packages for the ACT Apricot, and Epson QX-10, and AT&T UNIX PC. Very well researched and written up! Just like the other articles. Did you know that in Germany during the DOS era, WordStar had a larger market share than the otherwise quite dominant Microsoft Word? I even remember having gotten Wordstar for Windows 2.0 together with my first 486. The frame approach scared me off when it came to homework, but today, it appears as a very professional and handy feature. Just create a business letter template with standard distances, windowed envelope address field, sidebar for company details in WinWord, try avoiding frames and you'll know what I mean. Despite what some people may want to believe, Microsoft Word for DOS never had much of a market share. The Mac version gained some popularity, but most PC users stuck with other DOS programs until business started to adopt Windows 3.0 and Microsoft Office, which sucked in a lot of the business Mac users. The text editor on DR-DOS I had was very Word Star like and I used to really like it. Despite having Joe since 1992, I've stuck with vi on Unix based stuff.. it's easier than we, but you can still edit files when the console is all garbled up. I've only known one Word for MS-DOS user. And she was dead set on never going to Windows. But she had retired around 95. The Microsoft Word tidal wave was enormous. I think it was largely from the cheap office+Windows+DOS bundles on new PC's from Gateway 2000, DELL etc. During early 90s, our firm used the Dos programs Lotus Symphony 2.2 and Msft Word 5.0. I personally had been using Wordstar (3.3 to 5.5), but became a convert to Word 5. It had great formatting tools that made writing operation manuals quick and easy. The Print Preview was a revelation at the time. It also had an ASCII mode, so it became my primary text editor because it could load huge program files. At the time, many of the text editors could not load the large programs we were dealing with. I used to keep an installed version of the program in my briefcase that I could copy to the clients PC for program editing. I still like Wordstar, but when I go back to it, I always need to do a quick review of the command key combinations. But once you have the key combinations memorized, Wordstar is a very efficient Word Processor. Never used WordStar, but I have used Joe. I find it to be distraction free and much easier to write in. I could see why some people prefer it. I just installed wordstar 4 on a 16gb thumb drive using Rufus to make it bootable. Ran it on a Dell E6220 i7. ran great. wrote a quick document, saved it, reopened it, closed program and the pushed the off button. I like dos, it doesn't ask me if I really want to shut down. it just disappears when I push the power off button. now to figure out how to print. love me some wordstar, fast and clean and no mouse or touchpad needed. The very first PC I had was a used Leading Edge Model M XT clone. My parents bought it from a print shop. I remember it had both Wordstar and WordPerfect installed, but the green screen CRT had the WordStar function key display burned into the screen, so it was clear which one was used more heavily.